I was beyond excited when a #BigGreenBox arrived at my doorstep. Little did I know that its contents would make cleaning up after four (yes, four!) crazy pugs an easier task – and leave more time for fun with Bing, Baxter, Della and Marlo. 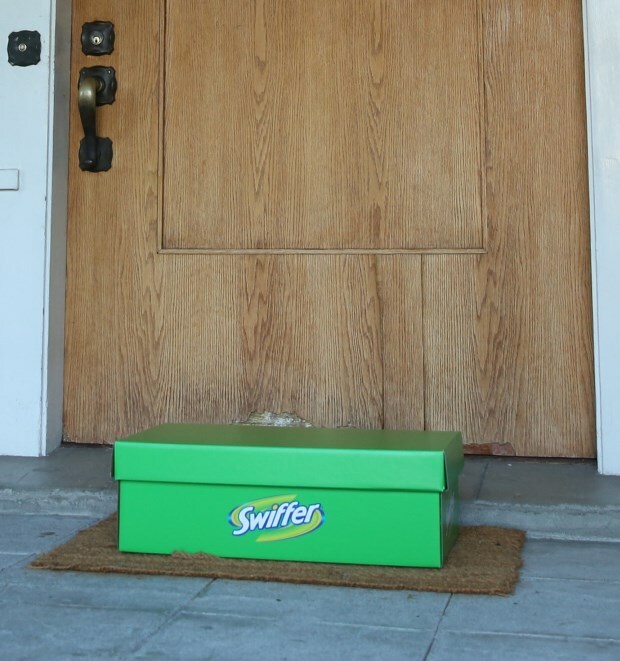 Inside was the Swiffer® WetJet. 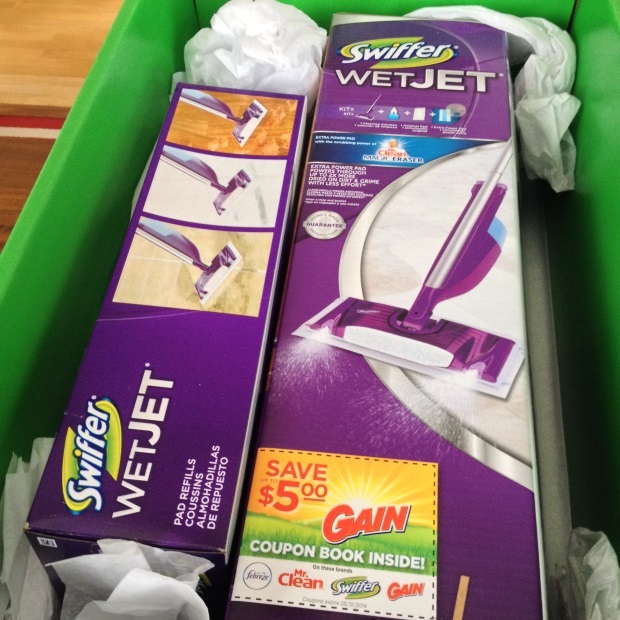 Now I’m a long-time Swiffer Sweeper user, but I’ve never tried the Swiffer WetJet. The Swiffer Sweeper is great for picking up dust and dog hair. With four pugs, there’s dog hair everywhere. If you didn’t know, pugs actually have two coats of fur (an overcoat and an undercoat), so they SHED BIG TIME. Bing and Baxter, my boys, are dark apricot fawn pugs so their fur is easy to spot on the couch but not so easy to see on the hard wood floors. And Marlo and Della, my black pug girls, leave a trail of black fur everywhere. Keeping the floors clean from dirt and dog hair is a daily chore. Readers of Baked Chicago know I hate doing dishes, and really any type of clean up. But I like having a clean house and especially a clean kitchen. I do have a weekly maid service that comes in to “power clean” the bathrooms and dust everything (I’m highly allergic to dust and pollen) but in between the weekly cleanings life happens. Prior to getting the Swiffer WetJet, I’d either use a wet rag or my Swiffer Sweeper with a wet cloth to clean up a dirty mess. But the Swiffer WetJet is so much more convenient because it’s got the cleaning solution built into the handle. And when you store it with the attached pads, you literally can grab it at the first moment a spill or dirty accident happens and use it immediately. I used it on my kitchen hardwood floors and I was able to attack the dirt faster than any other method I’ve tried before. Less time cleaning means more time to play with the pugs. And everybody in my household likes that! We take turns in this house with weekly chores. It’s Marlo and Della’s turn to help clean the floors. Bing and Baxter are supervising our work from the couch. That counts as a chore, too! When I think back to growing up, my mom pretty much took care of cleaning the entire house until we all got old enough to help out. With two sisters and three brothers, there was no division of labor along gender roles. Everyone helped make the mess, so everyone had to help clean up. Admittedly, I wasn’t the tidiest kid until after college. Suddenly when you’re the only one responsible for taking care of yourself you learn that it doesn’t get done if you don’t do it. This floor is sure to pass the #MomTest thanks to help from Della and Marlo. 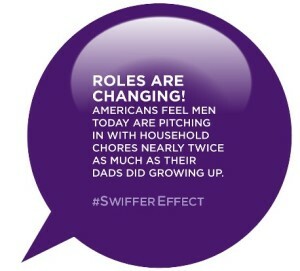 It’s time to spread the #SwifferEffect and I’ve nominated my brother Sam. No shade. Just sayin’. Check out this fun video with Eric Stonestreet and his mom. I know exactly how he feels. Like Eric, I’m glad I’ve got my “army of Swiffers” to count on to keep my house clean and give me more time to play with my pugs. Fall in line Swiffer Duster, Swiffer Sweeper and Swiffer WetJet. Forward march!